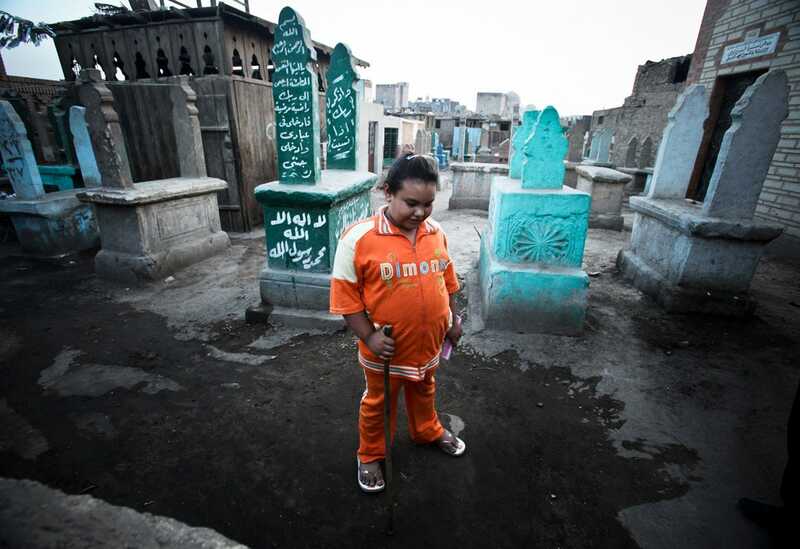 In southeastern Cairo, a city that’s home to nearly 18 million people, lies El’Arafa cemetery. It’s estimated that anywhere between 500,000 and 1 million Egyptians live in the 4-mile-long cemetery, which has led it to be dubbed the City of the Dead. In the cemetery, families, power lines, multi-story buildings, and a post office mingle with the graves, tombs, and mausoleums. 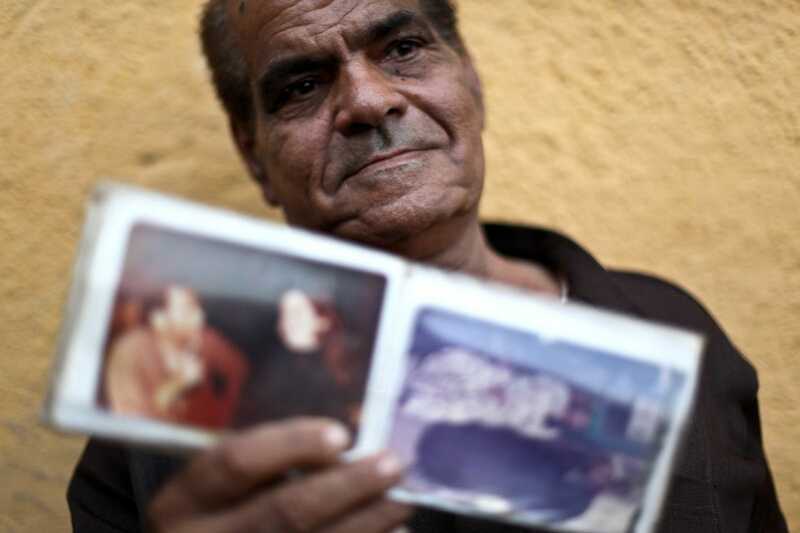 There are often three generations of Egyptians living in the necropolis, many of whom have been there since the 1950s. 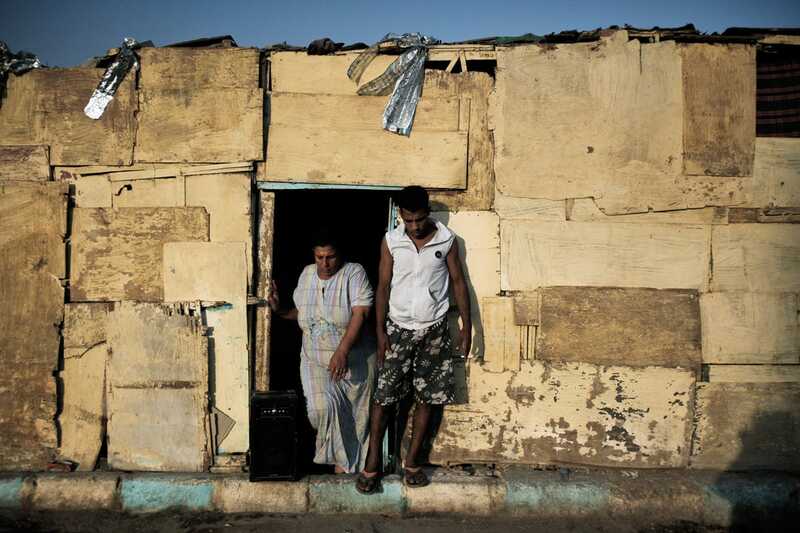 The settlement is far from legal, but the Egyptian government has long since given up on evicting residents. Doing so would require the unattractive proposition of moving the inhabitants to state-built apartments or forcing the creation of alternate slums. Iraq-Canadian photographer Tamara Abdul Hadi recently visited the City of the Dead to document the daily life of a family in the slum, which for the most part resembles any other part of the world, except for the fact that they live and sleep just feet from their ancestors. Hadi shared some of the photos with us here, but you can check out the rest at her website. While at El’Arafa, Hadi met the Abdel-Lateefs, led by the family’s patriarch, seen here, who moved to the necropolis in 1966. He and his wife, Atiyat, have raised five children at the cemetery, all of whom have grown up, gotten jobs in the area, and have kids of their own. All three generations live in the cemetery. The Abdel-Lateefs are not the only ones. 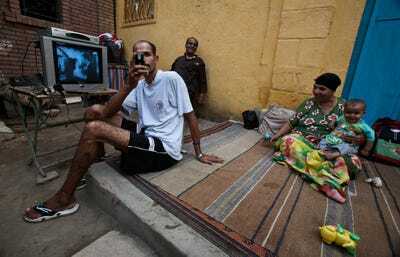 Thousands of families have been living in the cemetery since the presidency of Gamal Nasser in the 1960s. During Nasser’s presidency, rapid urbanization and the modernization of industries in and around Cairo lead to a massive migration that the city was ill-equipped to handle. The City of the Dead was one of the many slums to form as a result. Many of the first inhabitants of the cemetery were caretakers of the property, who dug graves and guarded the mausoleums. The original cemetery caretakers have passed the jobs on to their children. Caretakers can make $US125 a month, a good amount compared to the 40% of Egyptians who live on $US2 a day. “I’m not ashamed of living here. This is my home,” one woman, whose husband is a gravedigger, told Hadi. Those who don’t work at the cemetery work in odd jobs in the surrounding neighbourhood or sell food or produce from street carts. Most residents live in large tombs or mausoleums that they have outfitted with the comforts of a home, including a small kitchen, a garden, and a bedroom. The Abdel-Lateefs have a small shack to sleep in and an outdoor space where they cook, eat dinner, and watch TV. The Abdel-Lateefs, like many families, live on a family burial plot. This bedroom is a mausoleum. 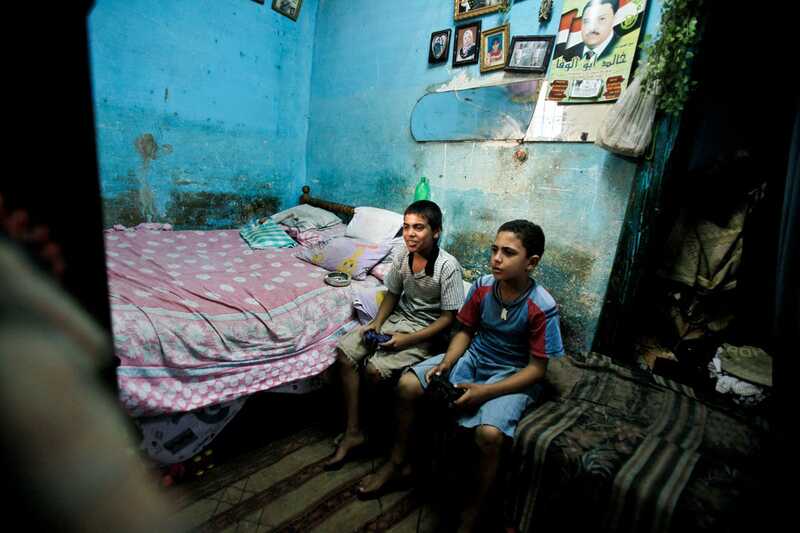 The boys are playing Playstation above where their uncle is buried. 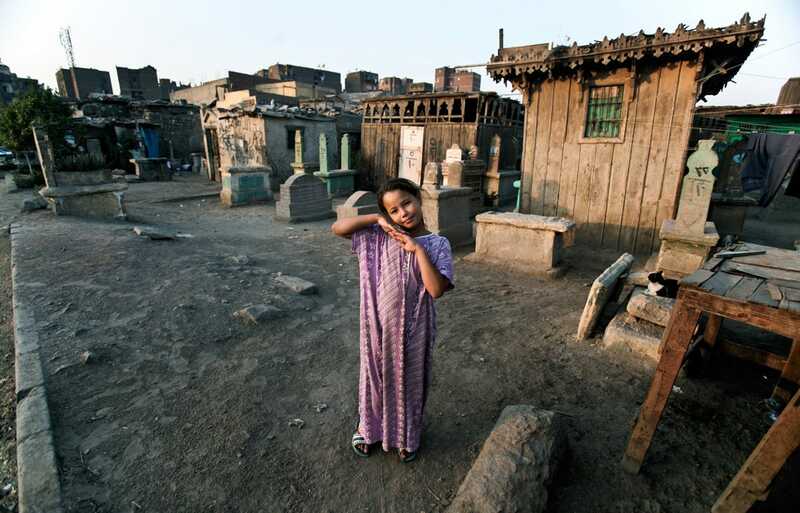 Life in the City of the Dead is actually far better than in other slums in Cairo. 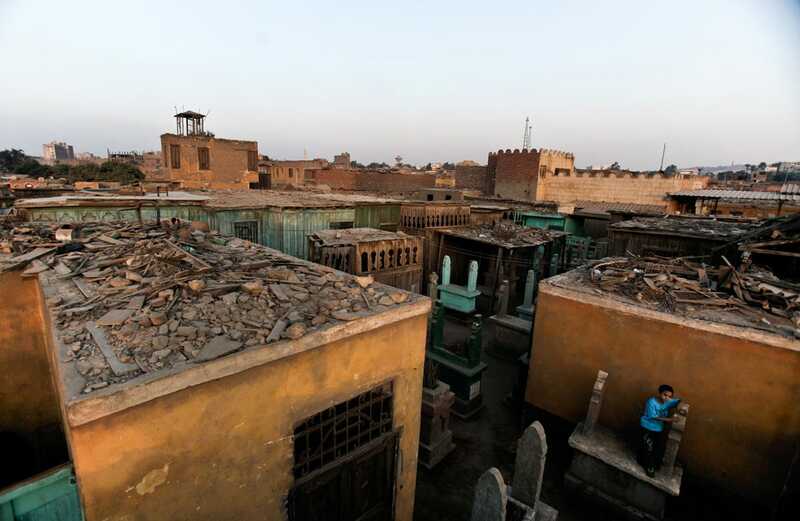 Many of the tombs are larger and cleaner than other slum living quarters and many residents have gardens and courtyards, an impossibility in other areas. Those living in the cemetery get creative with their living situation. 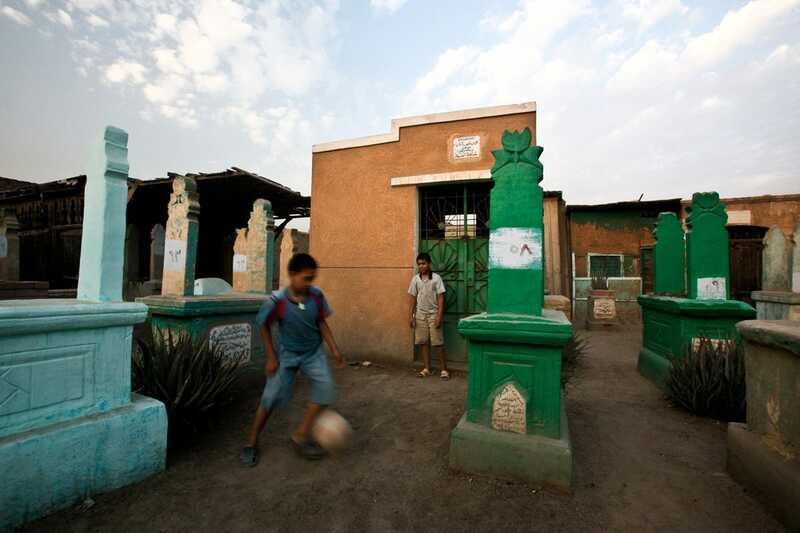 These kids were using a mausoleum door as a goal for a soccer game. The number of people in the cemetery has swelled since the 2011 revolution. 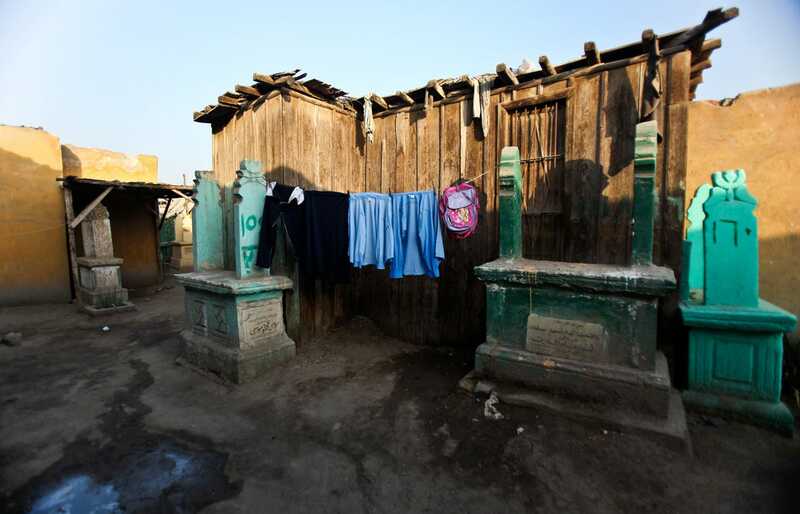 Increased poverty and unemployment rates have driven more people to look for the free rent that the cemetery provides. Crime has increased in the cemetery as well.